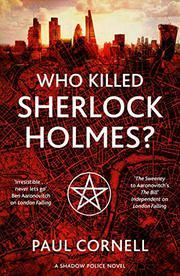 The discovery of Sherlock Holmes' murder leads an investigator of London’s true nature to seek out its meaning in the supernatural world. After the body of wheelchair-bound Christopher Lassiter is found with a mysterious message above it, London DI James Quill fears the murder investigation may require the specialized talents of very specific colleagues. The message is “Rache,” apparently taken from Sherlock Holmes’ first recorded case, A Study in Scarlet. Not coincidentally, Lassiter was once an actor who played Holmes. The connection is obviously meaningful to his death, but how? DC Kevin Sefton, Quill’s colleague, discovers the next murder in this crime spree, which marks the story’s plunge into the supernatural. It appears that Holmes’ noncorporeal being has been killed and that Sefton has been led to the site as part of a meditative dream state. From this point on, those unfamiliar with Cornell’s Shadow Police series (The Severed Streets, 2014, etc.) may need to consult previous installments to keep their heads above water. Quill assembles his Shadow Police team, each of whom is gifted with the Sight, which enables them to see London in its true form as something like hell on earth. Costain, Lofthouse, and Ross join Quill and Sefton in their pursuit of a criminal determined to bring Doyle’s fantasy to life. Each investigator has his or her own journey into darkness and relationship to the ongoing Holmes-themed murders as well as his or her own experience revealing the true character of London. Though each character is given an individual storyline and a connection to the larger movement of the plot, readers new to the series may find little reason to invest in their fates. Fans who have done their homework are likely to come away with a more rewarding experience.